It's been a weekend of amazing #MarchMadness basketball (sadly, my UCLA Bruins are out, but there have been great games in the tourney). Anyway, if you follow my Instagram, you probably know that I go to my folk's house every Sunday and have #breakfastwithdad (my little hashtag) while my mom attends church. I usually roast some potatoes & carrots, cut some fruit and fry an egg over easy (my dad's favorite). This morning, I downloaded the latest Food Network magazine (via the library*) and it's "The Big Breakfast Issue." Perfect timing, no? The article, "Hole in One!" has a dozen ideas for egg-in-a-hole...including grilled cheese! Give it a shot. 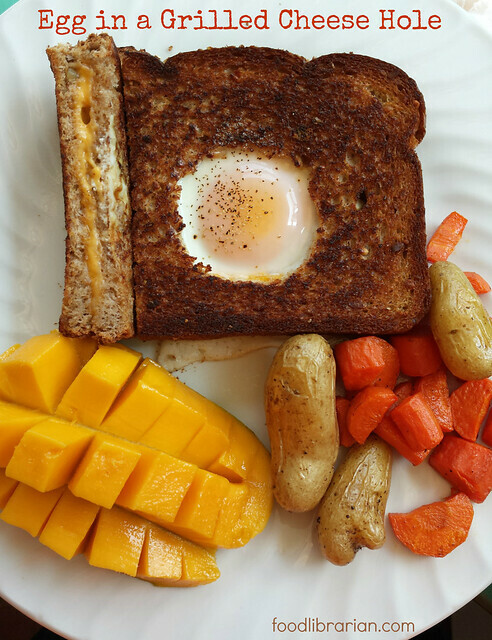 Egg-in-a-Hole breakfasts are always fun to make and eat. My oven was already on because I was roasting potatoes and carrots so it was easy. *Many libraries offer downloadable eBooks & Audiobooks, and now some are offering downloadable magazines - free with your library card! Ask about it at your local library! 1. Cut a hole in two pieces of bread with a cookie or biscuit cutter, small glass, or in my case, a knife. 2. Place cheese on bread. Butter the top of the sandwich. 3. In an ovenproof skillet, melt butter and place the grilled cheese sandwich in the skillet. Cook for 2-4 minutes, until the bottom is toasted. 5. Transfer the skillet to the oven and bake until the white is set but yolk is still runny (4 - 8 minutes, deeper "nests" take longer). I did not have an ovenproof skillet so I used a spatula and carefully transferred the sandwich to a tray lined with aluminum foil. 6. 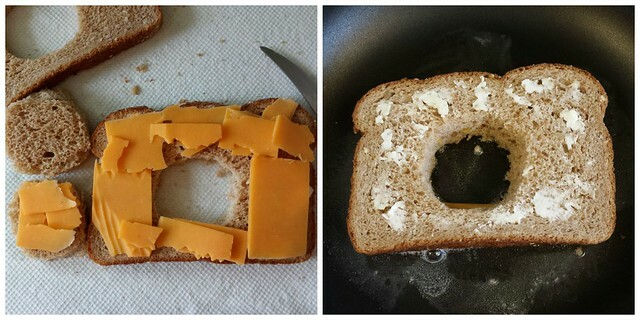 Don't forget to make the "bread hole" into a small grilled cheese sandwich or pieces of toast to dip into your egg!